Monschau (Montjoie in French; pop. 13,000) is a historical town in the Eifel mountain range, situated just 2km across the Belgian border. 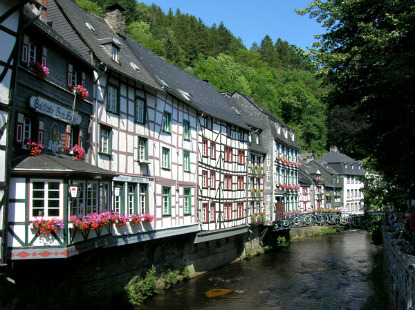 Historically known as Montjoie, the name was changed to Monschau in 1918. Left unscathed after WWII, it is one of the most beautiful towns in the Rhineland region, or maybe just in Germany. The whole town is dedicated to tourism, and teems with hotels, restaurants, cafés and souvenir shops. First mentioned in 1198, Montjoie developed around its castle (built in the 13th century). From 1433, the castle became the seat of the Dukes of Jülich. The town was besieged and plundered by Emperor Charles V of Habsburg in 1543. The Duchy of Jülich passed to the House of Palatinate-Neuburg in 1609. In 1795, the region was annexed by France, as part of the Roer department (with Aachen as capital). Awarded to Prussia by the Congress of Vienna in 1815, the town was made capital of the district of Montjoie (Kreis Montjoie in German). 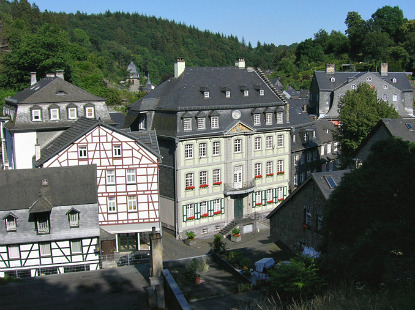 Nowadays, Monschau belongs to the district of Aachen. 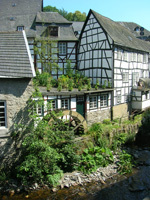 Monschau is a delightful place nested in the hilly forests of the High Fens region. It does not have specific individual attractions. What makes its charm are its narrow streets lined with half-timbered houses, the views of the small River Rur (written "Roer" in Dutch and French) or the panorama from the surrounding hills. Don't miss the watermill near the Markt (market square). 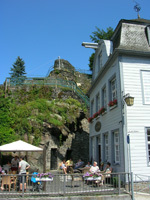 Most of the medieval castle is in ruins, and a youth hostel now occupies the building on top. Parts of the ramparts and many defensive towers can be seen a bit everywhere around town - mainly in the hills. 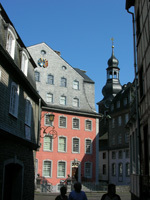 In the centre of town, note the Rote Haus ("red house"), an enormous Baroque townhouse that belonged to a local noble family. Four of the eight levels can be visited, and are indeed quite sumptuous. The first room of the left when you enter is filled with paintings in trompe l'oeil (the frames are painted on the wall, not real, which certainly prevents them from being stolen !). There are other trompe l'oeil paintings, such as the marble imitation in the staircase. You will need your own wheels as there is no train station in Monschau. The closest motorway is the E40 between Liège and Aachen. Take exit 38 for Eupen, then follow the N67 through the High Fens Natural Park until Monschau. Coming from Cologne, take the E29 (A1) towards Euskirchen, where you change for the B266 (exit 111) and follow the road through Gemünd and Schleiden. 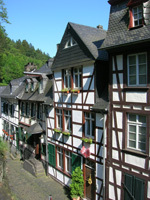 Coming from Luxembourg or Trier, take the E42 to Prüm, then the B265 to Schleiden, and finally the B258 to Monschau.